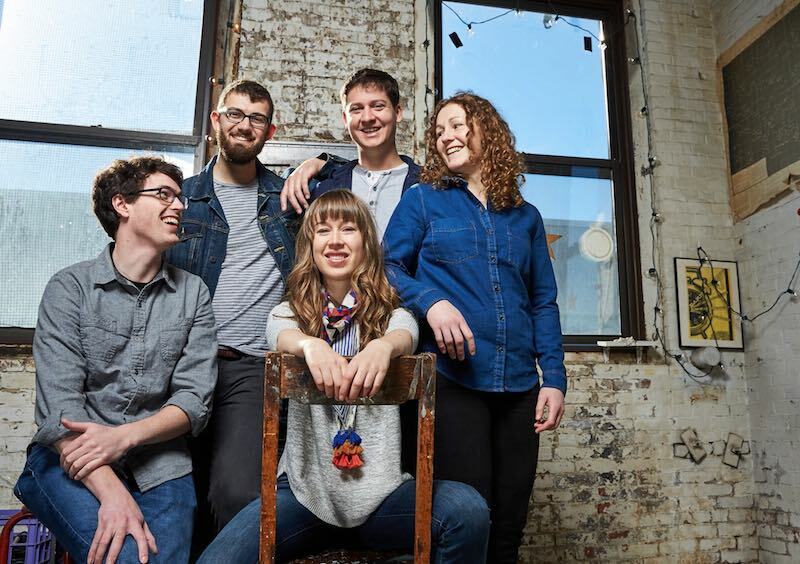 IBMA Momentum Award winners, Instrumental Performance, Emerging Artist nominees Mile Twelve release their new full-length album, City on a Hill. The new album was produced by guitar-great Bryan Sutton and engineered by Ben Surratt. City on a Hill is comprised of ten new songs that feature Mile Twelve’s impeccable ability to tackle dense and often heavy subject matter from an easy-going, honest perspective. In combination with their masterful storytelling, Mile Twelve’s David Benedict (mandolin), Catherine “BB” Bowness (banjo), Bronwyn Keith-Hynes (fiddle), Evan Murphy (guitar, lead vocals), and Nate Sabat (bass, lead vocals) show a command of their respective instruments that reaches well beyond their years. We all inspire each other and recognize that everyone has different strengths. What makes this band so collaborative is that everyone in the band can do something at a really high level. That’s the balance. We’re all challenging each other – Evan Murphy. City on a Hill opens with Down Where the Drunkards Roll, a galloping version of the Richard and Linda Thompson-penned tune. Onward, the songwriting prowess of Mile Twelve shows up in a number of songs and laments seen through the eyes of a wide cast of characters. Jericho follows a modern war veteran’s struggle post-trauma. In Liberty, a Jewish immigrant tells their child the story of fleeing war to the United States of America. Innocent Again is a rollicking study of the stigma attached to one’s time spent in the penal system. The waltzing Barefoot in Jail and the dream sequence of Journey’s End roll right into album closer, John Cloyd Miller’s portrait of small-time life, Where We Started. The album’s title alludes to the idealised imagery of a shining city on a hill; a historical phrase that is often used to describe Boston, MA, where the band got its start in 2014 after recognising each other as regulars of a Tuesday night bluegrass jam in a Cambridge dive bar. Honing in as a band, Mile Twelve caught the attention of now-producer Bryan Sutton with their debut album, Onwards. I’m a fan of bands who strive for a balance of being musically unique and individualised, while at the same time working to include honoured traditions found in this music. This blend is not an easy thing to accomplish. Mile Twelve does this with well-honed and refreshingly honest songwriting, along with powerful playing, singing, and performing – Bryan Sutton. For more information, please visit the band’s website, or to buy the new album, please click here. We previously advised that Mile Twelve from Boston are playing at this year’s Dorrigo Festival. They have recently announced their Australian tour dates presented by Due South Touring Co.
Mile Twelve is a fresh, hard-driving young band beautifully walking the line between original and traditional bluegrass. Fast gaining recognition for their outstanding performances in bluegrass and folk circles, Evan Murphy, Bronwyn Keith-Hynes, Nate Sabat, BB Bowness and David Benedict write captivating songs and daring instrumental pieces from diverse influences. Mile Twelve is carrying the bluegrass tradition forward with creativity and integrity – Tony Trischka. The folks at Dorrigo have been working towards the 2017 Dorrigo Folk and Bluegrass Festival and so far have amassed an extraordinary line up of folk, bluegrass and old-time artists from around Australia and overseas. Since their formation in the fall of 2014, Mile Twelve has quickly been on the rise. They released their debut 6-track self titled EP, and performed extensively throughout the U.S., Ireland and Canada, including several major festivals; Grey Fox Bluegrass Festival, FreshGrass Festival, Wind Gap Bluegrass Festival and Joe Val Bluegrass Festival. A track from their debut EP was featured on Sirius XM Bluegrass Junction’s “Hand Picked with Del McCoury”, while another track was featured on Spotify’s “Fresh Bluegrass” 2015 playlist. That same year, they were selected as formal showcase artists at the North East Folk Alliance. The summer of 2016 has held more milestones for this young group: opening for Tim O’Brien at the Station Inn in Nashville, winning the Podunk Bluegrass Festival Band Contest and being nominated for a Momentum Award by the International Bluegrass Music Association and adding a fifth band member: mandolin player David Benedict. This winter they will be heading into the studio in Nashville to record their debut full-length album with producer Stephen Mougin at the helm. Check the Dorrigo Folk and Bluegrass Festival Website for a full rundown in this year’s artist line up.